Really Make Holidays Family Time! I am always looking for ways to make the holidays easier and I gladly share ideas for simplifying the holidays with you. If your home is anything like mine, the holidays are a wonderful time to get together with family and friends. It can be a marvelous, exciting week of activities, cooking, talking, meeting new friends or prospective family members and maybe even a little shopping. 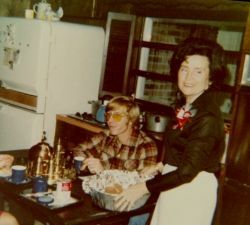 When I was a little girl, my grandmother used to work constantly from the time she woke up until the time she went to bed trying to make the holidays exceptional for everyone else. She accomplished that goal. The rest of us had a fantastic time while my grandmother worked away the hours. She would occasionally accept help. I know my mother did everything she could to ease the burden from my grandmother’s shoulders, but the more my mom did, the more my grandmother added to her list. It seems that if my mother was baking the ham, turkey and dressing, then that freed my grandmother to bake another cake, add another side dish, etc. She never rested. Unless you were filling your coffee cup or just hanging out in the kitchen, she rarely spent time just visiting. Now I wish she had spent less time in the kitchen and more time joining in the chaos in the den. That is what I would wish for everyone. Spend less time in the kitchen and more time with your loved ones. Let’s explore just a few ways to make life a little more enjoyable for the hostess. Normally, I am the first to drag out the china and crystal. Why do we think we must use our best china during the holidays? Let me suggest this: Save the china for birthday dinners and purchase disposable plates and cups for the holidays. Since our family members live all across the US and travel home for the holidays, we are cooking and cleaning for days. Neither the refrigerator nor the coffee pot get a rest. Everyone has different sleeping habits. We have a lot of night owls in the group and just as many early birds. Thus, the hostess would probably average 3-4 hours sleep IF she tried to spend every waking moment with the guests. If she goes to sleep before the night owls, the plates and cups are waiting in the sink when she wakes up. One can hardly start breakfast until the sink is clean. If she stays up with the night owls, it is lunch time before she can drag herself out of bed and we don’t even want to talk about the mess in the kitchen if someone else cooks breakfast for the early birds! Therefore, I propose leaving the disposable table cloth, napkins, plates and cups on the kitchen counter. Then when the night owls want their midnight snack, they can just toss their plates and cups in the trash can instead of the sink. WARNING: Mom, don’t wash the disposable cups and plates! Seriously, when out of town guest ask what they can bring, suggest sturdy paper plates and disposable cups. You can be “green” the other 350 days out of the year. My mother and I spend several days cooking before our guests arrive. We have devised a schedule that works for us and I will share it with you. At Least A Week Before: Prepare the hot drink mixes. We like the Hot Chocolate Mix and the Spice Tea Mix. 5 Days Before: Go to the grocery store. Buy all the canned goods and non perishable items needed for the upcoming week. My father and my husband are excellent “quick trip with a list” grocery shoppers in the upcoming days, but the big grocery buying day must be done in advance. 3 Days Before: We bake the coconut cake and any candies we are going to make. The coconut cake is better if you let it set in the refrigerator for 3 days. 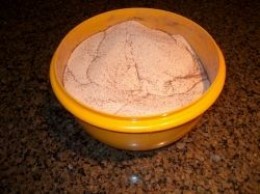 It allows the ingredients to “marry”. 2 Days Before: We clean our houses, making sure all the beds have fresh linens and all the bathrooms have clean towels. 1 Day Before: We cook! This is actually my favorite day. On this day, Mom comes over to my house and we cook the turkey and dressing. We make the Pumpkin Pies. We laugh and taste test our way through making the Sweet Potato Casserole, deviling our eggs and mixing the Fruit Salad. We also make the sweet tea and sometimes a Strawberry Trifle. The Big Day: We heat up the dressing, we make the gravy and the green bean casserole. We boil and mash the white potatoes and we have a little pasta side dish we always prepare. We pop the dinner rolls in the over and, voila , dinner is served! GREAT TIP: Mom makes the best roast in her crock pot too! It makes a great dinner for the day after. Yes, I said disposable. My sweet mother would wash all of these pans and reuse them. That defeats the purpose of purchasing disposable. Buy the disposable turkey roaster pan, as well as the side dish pans, and when you are finished eating, throw the pans away! Okay, it is permissible to leave the leftovers in the pans for a day or two, but after that, throw them away. If you feel the dish soap calling your name, ignore that voice and throw the stupid pans away. Remember my Motto: You can be “green” the other 350 days of the year! Do you know that there are acrylic disposable serving dishes? They make the table beautiful, but their real beauty is that the can be thrown away. This is also great for the potluck dinner parties during the holidays. If you forget it, you haven’t left behind your great grandmother’s serving dish. Advice: Ignore the voice of the dish soap! With that in mind, I buy Clorox Wipes, Windex Wipes, Clorox Toilet Wand, Swiffer dusters, Mr. Clean Magic Erasers and Shout wipes. These items just make life so much easier when there is a house full of company and a lot to do. I can’t even begin to count the many times those handy Shout Wipes have saved someone’s favorite shirt or how many times that Mr. Clean Eraser has rubbed away the mysterious marks on the walls. Therefore, Make Things Easy on Yourself! Line your Stove Top Drip Pans with aluminum foil. 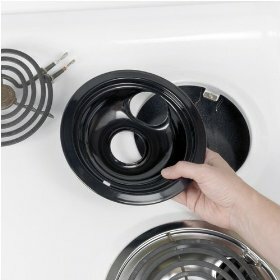 This may sound funny, but it is amazing how much work just covering your stove top drip pans before you start cooking will assist you in the kitchen clean up. No more burnt on, crusty mounds of mess to scrub off. When you are finished cooking for the day or week, just pull off the aluminum foil and toss it in the trash. How nice to have clean stove drip trays without having to have dry, sore, red hands. Because we have such a large group, we always need a lot of ice. For several days before company arrives, we like to fill gallon size freezer bags with ice when the ice maker is full. Freezer Bag Tip: When the ice bag is empty, dry it and save it for leftovers. It was only water. During the holidays, there is really nothing more valuable than large trash bags, especially if you take my advice and buy everything disposable. Before you start opening those gifts, hand out trash bags. I would estimate about 1 bag for every 4 people will work nicely. As the ecstatic gift recipient rips into their gift, they can throw their trash directly into the bag instead of on the floor. Perhaps you can even get little Jeffrey to toss his paper basketball into the plastic “net” instead of hurling it like a toy grenade at grandpa. Gift Opening Tip: When the event is over, ask you most helpful assistant to walk around the perimeter with a trash bag and pick up any remaining paper. Mom uses the disposable Crock Pot liners. She believes they are absolutely wonderful and she will actually throws these liners away! When you use a Crock Pot liner, washing the crock pot is much easier. Reminder: Make It Easy On Yourself! When someone says “What can I do to help?” don’t just answer “nothing.” Give this volunteer a job. Always be ready with a good answer like “could you take out the trash”, “can you stir the corn on the stove top”, “could you pour the drinks”, “could you call everyone to dinner.” You get the idea. If you turn them away, they will stop asking. No one likes rejection. Best Overall Tip: ACCEPT HELP! If you have a tip on ways to makes things easier for the holidays, I would love to hear it! Simply leave me a note in the guestbook below. Miss Mouse, not only is this a gorgeous site, but your advice here on planning for the holidays, and ways to make it easier are stellar ideas. This page should be a standard primer for anyone planning a gathering over the holidays, or for that matter any big party. Before anyone begins working up their party, they should be directed to Miss Mouse’s page on Ten Ways To Make The Holiday Easier. Great work here!! I’m no longer hosting holiday dinners, since this has been passed to younger family members now. I did use paper dishes and napkins at our Slava celebrations, which required more work than the average holiday dinner, and it saved a lot of work. I like your cooking schedule, but when and how did you reheat the turkey cooked the day before? That would be important for me should I host again, since turkeys are so unpredictable. My guests all live at least a couple of hundred miles away and come and go on the same day. Waiting for a turkey to finish cooking if it goes over can stress everyone, as can waiting for the guests, who may have been caught in traffic, to arrive if the turkey got done early. We don’t reheat all of the turkey Barbara. Several of our family members prefer it cold. However, the half that I do reheat I place the slices, single layer, in an aluminum roaster pan, cover it with aluminum foil and put it in the oven for 25 min. on 325 degrees. It helps that I have 2 ovens.